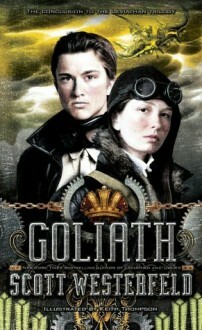 The riveting conclusion to Scott Westerfeld’s New York Times bestselling trilogy that’s “sure to become a classic” (School Library Journal).Alek and Deryn are on the last leg of their round-the-world quest to end World War I, reclaim Alek’s throne as prince of Austria, and finally fall in love. The first two objectives are complicated by the fact that their ship, the Leviathan, continues to detour farther away from the heart of the war (and crown). And the love thing would be a lot easier if Alek knew Deryn was a girl. (She has to pose as a boy in order to serve in the British Air Service.) And if they weren’t technically enemies. The tension thickens as the Leviathan steams toward New York City with a homicidal lunatic on board: Secrets suddenly unravel, characters reappear, and nothing is as it seems in this thunderous conclusion to Scott Westerfeld’s brilliant trilogy. I didn't quite enjoy it as much as Behemoth but it was a great finish to amazing trilogy.